Are you on Instagram? Do the words amaro, valencia, earlybird, or hefe mean anything to you? Do you find yourself stopping every few feet while walking around Downtown (or another part of the city) snapping photos and telling people to "Hold on, I gotta share this!" Well good news, you're among friends! 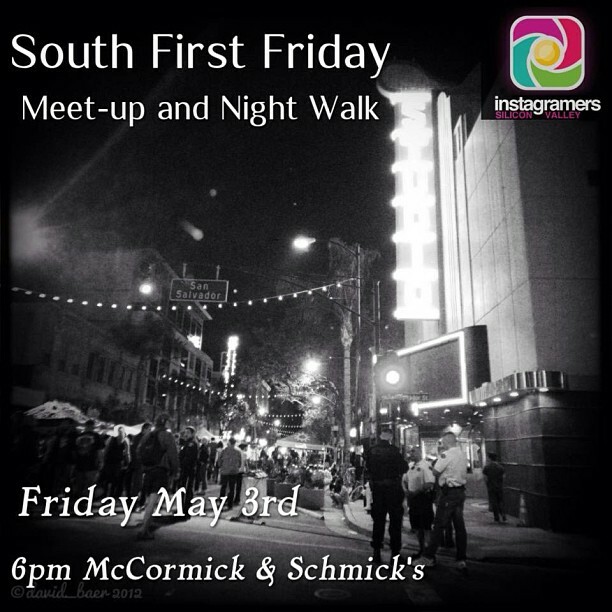 This Friday, at the South FIRST FRIDAY event, Instagrammers Silicon Valley is holding a meet-up and night walk. Just make sure your cell phone is charged and ready to snap photos. The group meets at 6pm at McCormick & Schmick's for Happy Hour and then will start the walk at 7pm. Meet up with fellow Instagram enthusiasts and photographers while enjoying the evening's FIRST FRIDAY event.